Nutritional Shake Mix with bioactive nutrients and protein to help you get the nutrition you need to lose weight, or just feel great. 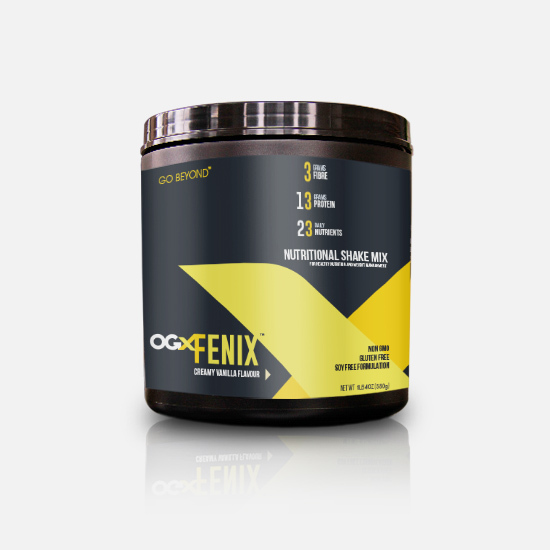 FENIX is our exclusive shake mix for Healthy Nutrition and Weight Management. It combines a concentrated whey protein along with vitamins, minerals, prebiotic fiber and our ganoderma mushroom. Use this delicious shake mix every day, to help you lose weight and get good nutrition. FENIX offers a convenient, fast, nutritional meal that can help you save money, and maintain or lose weight. The shake mix contains 110 calories or 250 when mixed with milk as directed, to provide you a balanced meal. The shake features our own proprietary blend of protein, fiber, and nutritional support bringing the Treasures of the Earth to a great tasting, creamy shake. Whey Protein Concentrate – a superior biological protein that can help support lean muscle, help you fight hunger, and deliver great tasting nutrition, fast. Fibersol®/ Resistance Maltrodextrin – for a healthy “gut feeling”. Sodium and Potassium – contains sea salt which is lower in sodium than other brands. The shake provides electrolytes of sodium and potassium to support good health.